What is that new gait trainer Maya has been using? It’s called the Up and Free and its fantastic! **Please note that I have not been paid nor have I bartered to discuss the Up and Free. 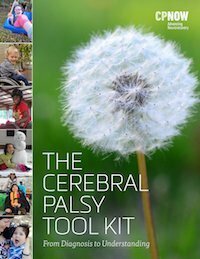 I just think it’s an awesome piece of equipment and it’s worked so well for Maya that I wanted to share it in case it may work well for some of your children or for adults with CP who follow our blog. I had been eyeing the Up and Free for several years at the annual American Academy for Cerebral Palsy conference. I would try it out each year and then leave the conference thinking that we needed to find something similar to it for Maya. I didn’t initially pursue purchasing it because we didn’t have an easy way for Maya to try it out and it was likely going to be a struggle to get it covered by our insurance plan. But, over the last few years as we tried one gait trainer after another, I saw that nothing came close to the features offered by the Up and Free. What I didn’t know was if those features would work as well in practice for Maya as they did in theory and with me trying it out. This past Spring Maya yelled at me that she didn’t want to use her walker anymore because she felt too unstable in it. I couldn’t blame her since we had trouble with it being very prone to tipping. I decided it was time to try the Up and Free. By this time, Mr. Razon the engineer developer of the Up and Free, knew me fairly well and we had a comfortable rapport. We paid to have the Up and Free shipped to our home on a trial basis. If there was a demo near us we would have had our regular equipment vendor make these arrangements, but it was proving too difficult to locate one and I figured we waited long enough to get started. I have learned to get to know equipment and work with it for a while before getting excited and investing money in a new purchase so I always stick to my rule of trying equipment for a few weeks before we buy it. Too often we have seen items that have initially appeared to be a great fit in the first few hours or days but turn out to be not what we thought. Our initial trial made us feel comfortable in moving forward with our purchase and after many months, it has met and even exceeded my expectations. With the help of our therapy team we have made minor adjustments along the way, but I can confidently say it is one of the best equipment purchases we have ever made. The Up and Free addresses several issues we have faced in helping to facilitate exercise and walking for Maya. 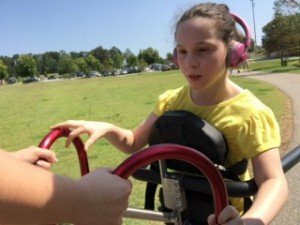 Maya is primarily a wheelchair user and a GMFCS IV (according to the gross motor scale for CP). She has lots of problems with balance and stamina so it’s not easy to find opportunities for her to exercise and practice walking–something she is very motivated to work on. 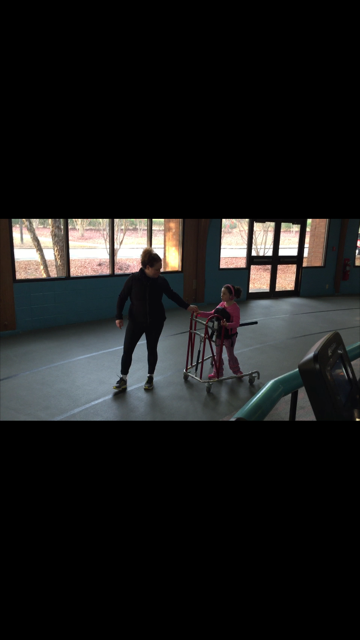 Every gait trainer we have tried has either been too bulky, provided too little support or didn’t provide support in the right places for her. 1. It has a dynamic seat (it moves up and down as she moves) attached to a piston which means that as Maya walks we can offload some of her weight which has allowed her to increase her strength and stamina over time. With her old walkers she had a very hard time making progress and petered out after about 20 minutes. 2. The design allows Maya to practice squats and other strength building exercises at home. This is really helpful because most of the time we give up on exercises because of the energy it takes to get her set up to do them. 3. The wide frame easily fits around Maya’s wheelchair and has worked well around our toilet so she can practice transferring into it and work on transferring in general. Transfers are something we need to work on especially as Maya gets older and she is motivated to practice with the Up and Free. She wants to be able to transfer into it and then move about the house. 4. The frame–although large is much more stable than her last walker and she feels secure in it. At the same time the security doesn’t come with extra weight like we have seen with other gait trainers. It also glides smoothly along door frames which prevents her from getting stuck and allows her to self-correct without much assistance. 5. Maya has had more exercise and strength building opportunities with this piece of equipment than any other we have tried. She loves it and for the first time in her life she has enjoyed observing her surroundings from a new vantage point. This year she was so excited to walk beyond the few houses surrounding ours and see everyone’s holiday decorations. She doesn’t care to cruise around the neighborhood in her wheelchair so this was new for her. FINALLY–I got pretty choked up a few weeks ago when Maya walked a half of a mile in her Up and Free. I really didn’t think that was possible. Even if Maya is not a full-time walker, it’s deeply fulfilling for her to meet goals she sets for herself. With all this talk about the importance of getting kids and adults with CP moving in any way possible I am relieved to find a way to support Maya’s body so she can exercise longer, bear weight and break a sweat!! Like I said, in the past she could walk for about 20 minutes and now she can walk exponentially farther and for an hour! Although it isn’t as portable as I would like (you have to break it down and hang onto some long screws), we regularly take it to the gym and have taken it to the park a few times. Here is video of Maya using her Up and Free from a couple of weeks ago—upandfree. You can see that I provide some support in helping her move forward. A caregiver or therapists can also provide support from behind as the individual walks. Are you interested in learning more about the Up and Free? This is fantastic! It’s wonderful to see Maya moving so well, and to know the increased independence this will allow her makes Sue and me very happy, too.